The next surprise was also from an aging player, when Seedorf scored a beauty right down the middle on a nice pass from Boateng. 1-1 Then in the 25th, apparently for dissent, Ramirez was shown a yellow following a foul. In the 29th, Abate put a dangerous cross in that Gillet had to punch away, not the last time this happened in this match. But the biggest surprise of the first half was on a free kick in the 45th when there should have been a handball called on Seedorf in the box, but no call at all. Rocchi, traditionally a pretty good referee, not only missed this call, but originally showed the yellow for dissent to Ramirez, for whom it would have been his second and thus he would have been sent off. But perhaps in a rare moment of good judgment on the night, and needing to give a card to someone, having shown it, he recorded the yellow for Kone instead. There is no right side of a wrong call. The second half started with the bitter taste of the poor officiating, which in hindsight was quite one-sided for Milan all the way through. Perez came on for Casarini, and in the 47th, another great Di Vaio shot tried to surprise Amelia, but this time the post was there to meet it. Then Yepes got a yellow for pushing Ramirez in the back, a bit of a strong call, but not when you consider the injustices of the first half. In the 54th, Diamanti also had a beautiful shot that just kissed the crossbar, but was not to be. Then in the 55th, Yepez again pushing Ramirez in the box, but no penalty given. Despite earlier grievances with Rocchi, it did seem like Ramirez went to ground easily, so maybe a good call on this one. In the 57th, it was Pato getting physical to earn the free kick. This is not the same little duck we knew & loved, he can dish it and he can take it. In the 58th, I saw something funny. In Italy, there is an expression, “furbo,” which means “sly,” the literal interpretation on the pitch some might say was “dirty” or maybe just “cunning.” The gesture for “furbo” is putting an index finger next to your eye. Well Ibra looked like he was trying to do this, but then pretended to wipe something from beneath his eye or something. Maybe it was all my imagination, but I thought it was funny. The 59th saw Diamanti earn a yellow, heaven knows his opponents should have earned a few on the night. Then in the 62nd, Yepes, having been injured mixing it up with Ramirez earlier, was subbed off for Bonera. In the 67th there was a near surprise when Aquilani went for a diving header, but it went wide. 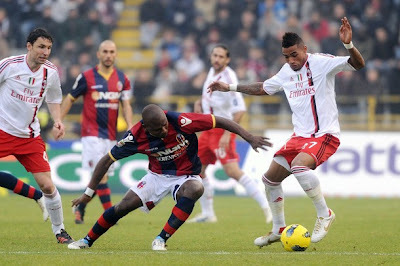 Right after this, Seedorf was subbed off for Emanuelson. 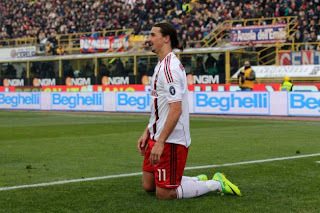 In the 70th, another surprise, courtesy of Rocchi, when a penalty was awarded for a Raggi foul on Ibra. I mean it was a pretty clear cut penalty, but after Bologna having been denied at least 2-3 deserved penalties, it was a hard pill to swallow, even for a Milan fan. 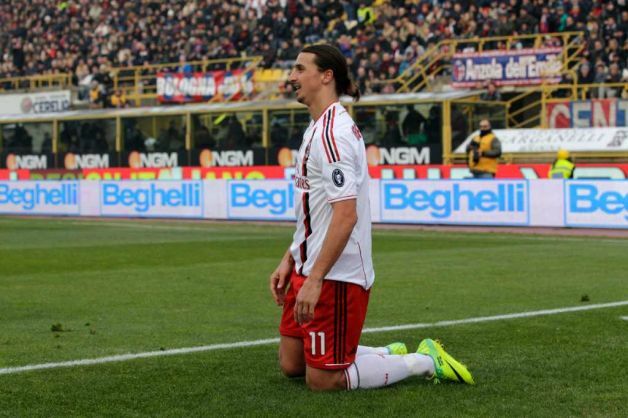 But Ibra took the penalty well, 2-1 Milan. This bravery was in turn rewarded with a nasty Boateng foul on Morleo, shades of the Boateng we rescued from Chelsea, and not the way that champions should play. But it was Perez who was rewarded with a yellow in the 75th. And in the 76th, Ramirez, having taken a knock earlier as well, was subbed off for Taider. And while the 4th official had the sign up, Allegri pulled off Patoo, who had been largely ineffective on the night, and put on Robinho. But it was too little, too late, I fear. In the 79th, there was a handball on Bologna that Milan wanted called, but it was not intentional, and finally Rocchi got one right. Emanuelson had been busy making things happen, but took a bit of a rash shot in the 80th with his weaker right foot that went wide. Diamanti, one of the heroes on the night, was subbed off in the 83rd for Cherubin. And the match came to a close in the same vein has it has been played on the night when Antonini was awarded a yellow card for a foul in the 90th+3. I didn’t have a standout performance pick on the night, Seedorf’s goal speaks to the quality we know he has, even if he has a hard time showing it for 90 minutes anymore. But for me, the MOTM was Abate. And not for his performance, but his haircut. Maybe it’s because he has to be respectable now that he’s a papa, maybe it’s because we’ve seen way too many Abate wannabe haircuts recently, but finally that boy got some sense into him and grew out his hair to cover his head. Surprise. Surprising was how we maintained 66% possession but were unable to crack the Bologna defense and take advantage of our chances, taking 13 shots but only 4 on goal. Surprising was how Bologna were able to take advantage of their chances, with outstanding offensive play that seemed to catch our boys off guard. Another big surprise was how Bologna started the match in 17th, and we started in 2nd, a shoe in to overtake Juventus with one slip-up. Yet this one was fairly evenly matched, despite the ridiculous disparity in payroll. 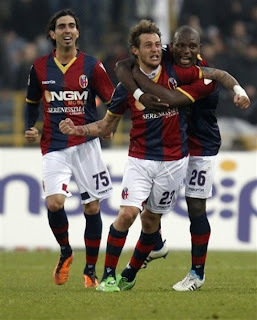 Bologna deserved better, possibly even 3 points on the night. But the biggest surprise on the night was unfortunately Signore Rocchi. I have always hated matches that are decided by the ref (or if I was Italian, by those who are paying the ref,) and this night was particularly disappointing that way. But it proves what I said in my preview post, that things are not always as they seem. Surprise. Bologna played for you tonight.